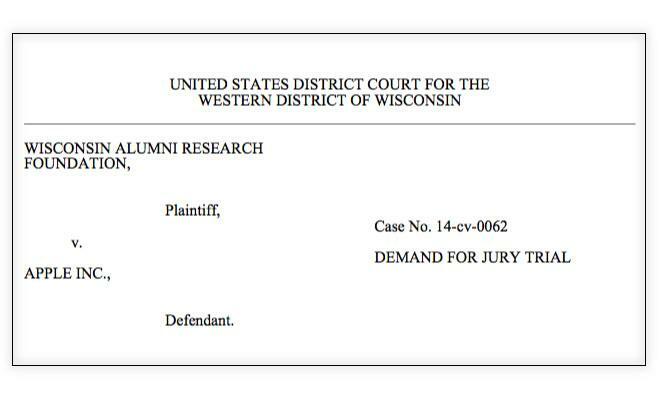 The Wisconsin Alumni Research Foundation, the patent licensing arm of the University of Wisconsin, alleges in a newly-filed lawsuit that Apple's A7 processor infringes a university-developed patent that improves "the efficiency and performance of contemporary computer processors." At issue is United States Patent No. 5,781,752 entitled "Table Based Data Speculation Circuit for Parallel Processing Computer." Computer scientists Andreas Moshovos, Scott Breach, Terani Vijaykumar, and Gurindar Sohi invented the technology while at the University of Wisconsin - Madison. A predictor circuit permits advanced execution of instructions depending for their data on previous instructions by predicting such dependencies based on previous mis-speculations detected at the final stages of processing. According to the foundation's complaint, the researchers' work "has been recognized as a major milestone in the field of computer microprocessor architecture/design." Sohi, the group's leader, was given the Eckert-Mauchly Award— "the computer architecture community's most prestigious award" —for the work contained in the patent, the filing says. Apple is accused of implementing the patent's technology in the company's new 64-bit A7 processor that powers the flagship iPhone 5s, iPad Air, and iPad mini with Retina display. The complaint alleges that Apple was aware of the patent's existence because it is cited in several newer patents issued to the Cupertino, Calif. company. The lawsuit was necessary, the foundation alleges, because "Apple has stated that it is the policy of the company not to accept or consider proposals regarding licensing from outside entities like WARF for any purpose." WARF is informed and believes, and on this basis alleges, that Apple has incorporated the technology of WARF's '752 patent into the A7 processor to achieve enhanced efficiency and performance. WARF now asks this Court to prevent Apple's unauthorized use of the '752 patent. The foundation is seeking an injunction preventing Apple from continuing to use the technology without a license as well as monetary damages— including interest— and legal fees.